Many problems, especially those related to environmental issues, are concerned with estimation of, and testing the significance of, a time trend in a series possibly when explanatory variables are included in the model. As is well known, if there is correlation in the residuals, and this is not accounted for, then incorrect inferences about the size of trend may be made. Regressions, of the type mentioned above, often contain not only correlated residuals but may have the more complicated form of periodic autocorrelation. In addition data may be missing. How much of an effect that these two problems have on trend assessment, if not accounted for, is not entirely obvious. 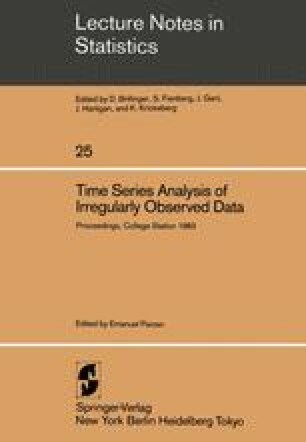 This paper describes how to perform correct inferences in regression models in which both of these problems exist and the emphasis is on easy to implement techniques in order that an assessment, of the impact of these two problems, can be made relatively easily. Application of the techniques is given to monthly average salinity measurements and to daily average carbon monoxide measurements. Both examples include explanatory variables and the emphasis is on assessing the significance of time trends. Evidence exists in both of these examples that the residuals are periodically correlated but the analysis shows that accounting for this more complicated error structure has little additional impact over a non-periodically correlated error structure. However, for assessing crossing probabilities, e.g.,, it is important to model the residuals correctly. Theoretical justification will be given for the methodology presented. This provides theoretical justification for the familiar Cochrane-Orcutt method (to correct for autoregressive errors in regressions) when there are missing data.